(CNN) -- Slim-line Retief Goosen celebrated his seventh U.S. Tour career triumph in Tampa Bay on Sunday when he won the Transitions Championship by one shot from Charles Howell and Brett Quigley. 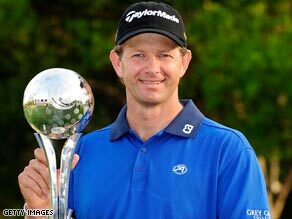 Retief Goosen's fitness regime paid a big dividend with his first U.S. tournament win for four years. Twice U.S. Open champion Goosen is 20 pounds lighter than a year ago having received a reminder from fellow South African Gary Player about the importance of fitness. And it paid a $972,000 dividend as the 40-year-old claimed his first victory in America for four years after a final round of 70 for an eight-under-par aggregate of 276. Goosen reckons he is the fittest he has been for five years and, having chipped in for birdie at nine, a 17-foot eagle putt on the 575-yard 11th proved to be the decisive blow. From one behind, he went one ahead -- and although Howell caught him with his third birdie in four holes at the 14th, the American followed with back-to-back bogeys. Goosen, whose last title came at the Africa Open in his home country in January, failed to get up and down from sand on the 16th and found dense rough by the 17th green. However, he played a great chip to three feet and then holed from nearly five feet at the 18th. "Obviously 11 was a turning point, and I scrambled my way in. The course was not easy," Goosen said. Howell and Quigley both had birdie chances on the last but missed from 25 and 24 feet respectively. Quigley was also a joint runner-up in Puerto Rico last week and has now played 342 PGA Tour events without a victory. Fifty-year-old former Ryder Cup captain Tom Lehman, seeking his first victory for nine years, led overnight, but three bogeys in an outward 39 dropped him into the pack. Lehman then drove into water for a double-bogey six on the 16th and finished in eighth place place after a desperately disappointing 75. Charlie Wi, trying to become the second Korean winner on the circuit in three weeks after YE Yang's Honda Classic victory, took over at the top with five birdies in his first 11 holes. But the 37-year-old then bogeyed three times and ended in joint fourth with Steve Stricker and Australian Matthew Goggin.